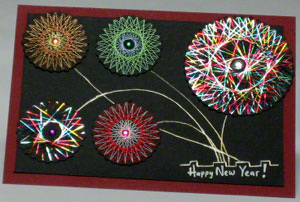 In Making This New Year Greeting Card, What String Types & Colors Would You Use? On the 5.5” x 8.5” black cardstock paper, use a pencil and circle template to draw a 2” diameter circle. On this same black cardstock, draw four other 1.5” diameter circles about 1” apart from one edge to another. Use the zigzag decorative edge scissors to cut out these five circles. Erase the pencil marks on these circles. Or use these pencil marked sides as the bottom faces. 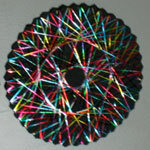 On the 2” diameter circle, use the multicolored metallic thread to wrap around the grooves of the zigzag cuts. After the first turn, go through another turn but this time with a different offset. Want to tie down the loose thread when before starting or after finishing the looping process? Use a very small piece of masking tape to tape the loose thread unto the back of the paper. On the first 1.5” diameter circle, use the multicolored metallic thread to wrap around the grooves of the zigzag cuts as well. On the second 1.5” diameter circles, first, use the metallic gold thread around on the circle grooves. Then use the metallic copper thread at a different offset. On the third 1.5” diameter circles, first, use the light blue rayon thread around on the circle grooves. Then use the light green rayon thread at a different offset. On the last 1.5” diameter circles, first, use the pink rayon thread around on the circle grooves. Then use the red rayon copper thread at a different offset. Put all the circles in place just to know their approximate locations on the 4” x 6” black cardstock paper. Don’t glue them down yet. On this same cardstock, write “Happy New Year!” with white pen on the bottom right corner. Use the gold pen to trace out a square-like pattern that looks like square rooftops at a distant horizon. Draw this just above the white lettering. Use the gold pen to randomly trace out the fireworks path from the distant roof top horizon to the circle locations. Glue the completed 4” x 6” black cardstock right in the middle of the folded maroon cardstock. This leaves a ¼” margin all around the black cardstock paper. And, at the end of the day, may you have a new year that's as fun and vibrant as this new year greeting card depicts.